I always thought this was a great song from the bin of 1970s soft-rock goodness. 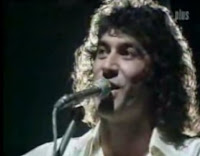 Albert Hammond (right) claims it was the miniature story of his life. He's got some other good stuff, but this is definitely his best song. Incidentally, he is the father of the renowned guitarist for The Strokes and solo artist Albert Hammond Jr. I've been playing this for a few years now, mostly with my last band, The Sprogs.